Shopping for Horror: Nightmare on Elm Street Action Figures? Action figure and horror movie fans will rejoice at this fantastic Freddy Krueger retro doll based on the A Nightmare on Elm Street Part 2: Freddy's Revenge film! 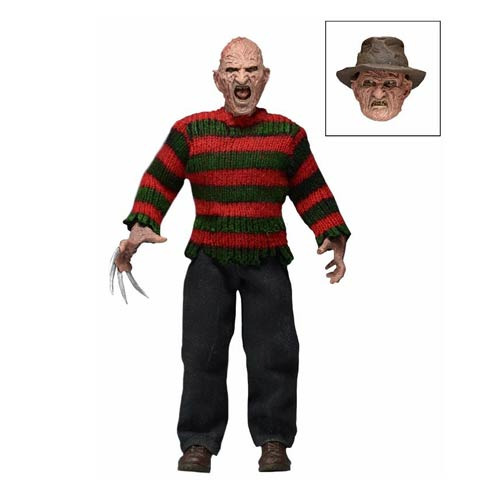 Featuring the likeness of actor Robert Englund, this Nightmare on Elm Street Part 2 Freddy's Revenge Freddy Krueger Clothed Retro Action Figure is poseable, and dressed in fabric clothing similar to the toy lines that helped define the licensed action figure market in the 1970s. Freddy comes with two interchangeable heads, interchangeable gloved hand and bladed hand (unique to this Part 2 version of Freddy), and a removable hat. Blister packaging with custom illustrated art and a resealable protective clamshell. Figure measures 8-inches tall.